KWord is now unmaintained since 2012. Users are recommended to switch to the Calligra Words fork. KWord is a word processor. Naturally it has all the features you'd expect - paragraph styles, indenting, bullets, tab stops, page breaks and full control of your fonts. There are templates for common requirements. Naturally. So where is KWord different? 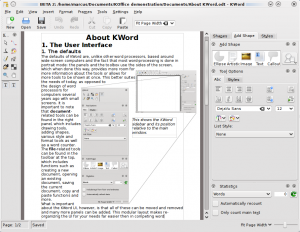 KWord is different in that it is frame based, so you have absolute control of your document. You may choose to work in columns like a news-sheet, or have a free layout as in a photo-album. Need captions on your pictures? No problem. The choice is entirely yours. Frames may be linked,in which case text will flow seamlessly, making professional-looking layout without the use of a fully-fledged desktop publishing package. 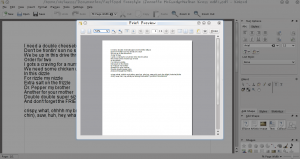 Longer documents sometimes need pages rearranging - the preview mode gives you that freedom. Of course page numbering and other details can be in headers and footers. Chapter numbering is taken care of, and there is an auto-generator for Table of Contents. Footnotes and Endnotes are supported. Maybe you need to produce your document in several languages? No problem. Select the font for your chosen language. 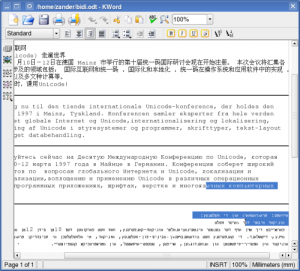 KWord has full support for right-to-left script languages. So what are you waiting for? It's time to get creative in your writing! Basic Layout a tutorial that creates a leaflet with various images and explaining text using KWord's frames technology. Several text frames and image frames will be created and positioned on the page. A Third Layout creates a photo album page to examine text run-around and text-flow. If you have an early 2.0 release you may have the bug that causes this. Simply delete ~/.kde/share/config/kwordrc and it will be re-created. Your toolbox will have been restored. This page was last modified on 1 March 2019, at 14:20. Content is available under Creative Commons License SA 4.0 unless otherwise noted.